Wow, I almost forgot that today is my 1 year Blogiversary! I can't believe I've been blogging a whole year. 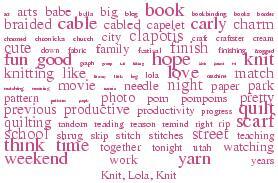 When I stumbled onto the world of craft/knit blogging last year, I was amazed at all the many talented people I found. I started my blog as a place where I could write my ramdom musings and basically keep my family up to date on what I was doing. I still feel like I'm trying to find my voice in the blog world, but I do it for me. Not becuase I think someone might read it, becuase really, who does other than my Mom? But I'm really grateful for the motivation and drive it's given the crafting I do. I think about it everyday now, and I think it's changed me because of it. I've become more creative and it's influenced my "eye". I see things differently now. With the start of 2006 I've tried to post more often and sometimes I get down about finding things to show or write about. I'm not witty and funny like so many out there, but I try to make my voice come through. I've done so many great things this last year becuase of blogging. 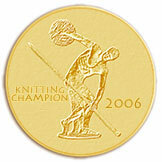 I participated in the Knitting Olympics, which was such a great push for me. I feel a conection to so many others out there, although they may not know it, since I'm more of a lurker than commentor. Anyway, I guess I just want to say I'm really glad I started this thing and I hope that someone can get something out of it. I know I have! And just becuase I hate posts without pictures here's something I did a while ago that pretty much sums my blog up! I appreciate your site and am inspired by how much work you do and how you have made the steps to share your work with others. When I read about the project you plan to do with your library, I realized I would like to - and should push myself to - contribute to a project in my community. So thanks for your inspiring blog!